Reliance Jio continues its authority in the new subscriber addition every month. As per the data released by Telecom Regulatory Authority of India (Trai) for the month of January 2018, the Mukesh Ambani-led telco has added a whopping 8.3 million new subscribers, taking its overall subscriber base to 168.413628 million. Other incumbent telcos such as Bharti Airtel, Vodafone India and Idea Cellular added 1.5 million, 1.2 million and 1.1 million new subscribers during the same month. State-run telecom operator BSNL added close to four lakh new subscribers. 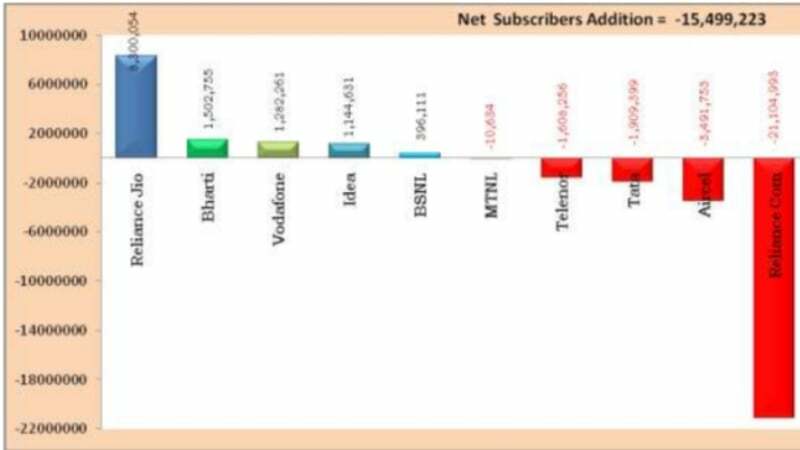 Another state-run operator, MTNL lost close to 11,000 subscribers, followed by Telenor with 1.6 million subscriber loss during the same period. Tata Teleservices lost close to two million subscribers, while a massive 3.4 million Aircel subscribers moved onto other networks. Reliance Communications lost a whopping 21 million subscribers during the same period. At the end of January 2018, Bharti Airtel is still the leading telecom operator in India with 291.671208 million subscribers on board, followed by Vodafone with 213 million and Idea Cellular with 197 million subscribers. As per the recent data released by COAI for the month of February 2018, Idea Cellular has crossed 200 million mark, while Airtel is inching towards 300 million mark. As of January 31, 2018, Airtel has a market share of 25.32%, followed by Vodafone India with 18.56%, Idea Cellular with 17.16% and Reliance Jio with 14.62%. BSNL is currently in safe hands with close to 10% market share and 100 million subscribers to its name. However, thanks to the RCom’s massive subscriber base loss, the total wireless subscribers (GSM, CDMA & LTE) declined from 1,167.44 million at the end of December 2017 to 1,151.94 million at the end of January 2018. 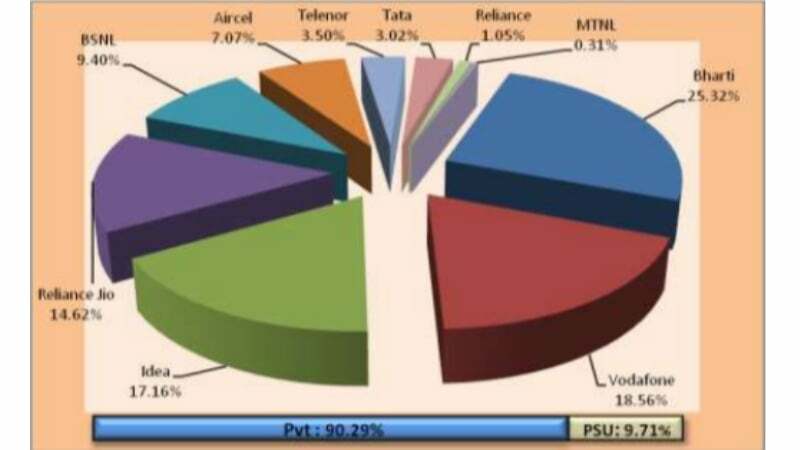 It is worth noting that private telecom operators currently holds 90.29% market share of the wireless subscribers whereas BSNL and MTNL, the two PSU access service providers, had a market share of only 9.71%. In February 2018, more number of subscriber additions will take place on Airtel, Vodafone, Idea and Reliance Jio networks as has filed for bankruptcy at the end of January 2018. Speaking about the Mobile Number Portability numbers during the month of January 2018, Trai received a total of 6.18 million requests. With this number, the cumulative MNP requests increased from 338.41 million at the end of December 2017 to 344.59 million at the end of January 2018, since the implementation of MNP. And this number will only grow bigger in February and March as telcos are receiving a good amount of port in requests from Aircel customers. Here everyone please note, Idea TN has lost more than 3.2 Lakh customers only in January 2018. 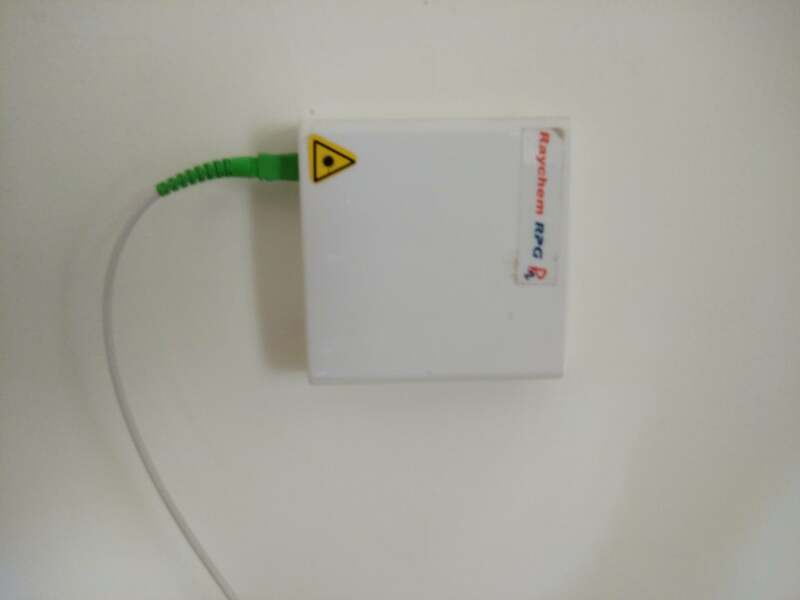 What’s the reason behind this…?